The sun has barely peeked out from behind the horizon as Elizabeth brushes her hands down her blue and white nursing uniform. She exits her home and makes her way down the long winding path leading to Sagam Community Hospital. She stops only to wave and talk to neighbors she has known for years. Maybe it is her warm smile or her soft yet firm voice, but from the moment you talk to Elizabeth Ogada, you feel the comfort and care that only a good nurse can provide. Elizabeth, or Matron as she is called by the hospital staff, has had plenty of practice in this role – nearly 30 years to be exact. Currently she serves as Sagam Community Hospital’s head nursing director, helping to coordinate nursing services within the hospital and to ensure the cleanliness of the facilities. “I was born right here in County,” (a subcounty of Siaya County) Matron tells me. Her eyes peering out over her low hanging glasses. Her hands rest gently on the desk in her office at the top of SCH. “This is my home – where I grew up”. I ask her about her family and she laughs. This is the same jovial laugh I have heard through the halls of Sagam in the morning while Matron checks in on the nurses in the wards. “I was the oldest of eight children,” she continues. “From the start I have always been the role model in the family. The one everyone looks up to and the one who was responsible for making sure all the house work gets done”. This sounds almost exactly like the role of a matron – to be a role model to all of the nursing staff and to make sure essential nursing and sanitation activities run smoothly. I point this out to Matron and she laughs again. “I really didn’t connect it until now but that is what I have been doing all along, since childhood”. Matron has wanted to be a nurse since standard E6 when she got sick and was cared for by several nurses in her local hospital. After she finished school, she enrolled in nursing school and received her nursing certificate. Later she would go back for her nursing diploma. For Matron, the hardest and most important part of being a diploma nurse is the critical thinking that is essential in every patient interaction. “You have to ask why you are doing things and sometimes you find yourself rubbing shoulders with others because you want to have more information”. After nursing school, Matron rose through the ranks. 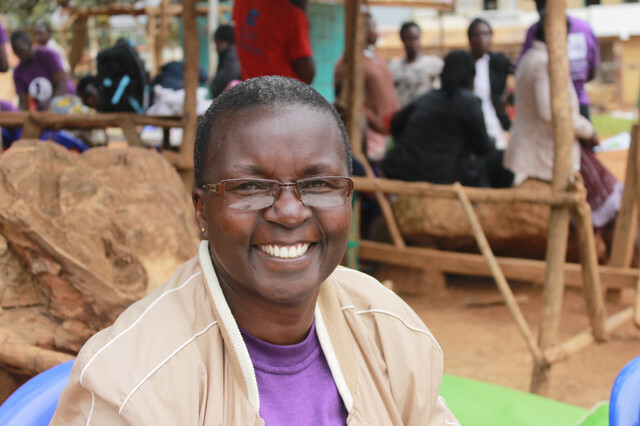 She served as a registered community health nurse, then as a nursing officer in charge of the wards, before being promoted to a senior nursing officer in charge of many hospitals in the sub county she was working in at the time. Eventually she made her way back home to Gem, where she took on her current role at Sagam. Being a nurse has changed Matron in many ways. Initially a very shy person, she has learned to build interpersonal relationships with her other nurses and patients. As a leader in the hospital, she has learned how to motivate her staff and evaluate their performance. She has developed a keen eye for identifying personal difficulties her nurses might face that negatively impact their work and has learned to handle those challenges in a caring and discreet manner. During her time at Sagam, Matron has been essential in separating the role of the sanitation staff and the nursing staff. She has also been an active leader of the outreach team. With her guidance, SCH outreach has grown from just seeing a few patients every Wednesday, to caring for more than a hundred members of the local communities each week. “The first time we started outreaches, we would just go somewhere and take outreaches there. But nobody would turn up. Eventually we talked to our community health volunteers and told them that each of them should invite outreaches to their homes. So, when we went to those locations for outreach we would find that these volunteers have mobilized people.” Matron continues, leaning back in her chair. “Through the family planning and the health screens at outreaches, I have seen women who thought they were sterile, give birth to children. We have managed to bring others who can’t afford care for our ketamine weeks.” It is clear that Matron takes great pride in Sagam Community Hospital and its dedication to communities around Siaya County. There is a lot to be proud of. In 2018, the SCH outreach team has already seen 2393 patients, given blood pressure screens for 2093 people, and seen over 800 patients for family planning services. All of this has been possible because of Matron’s leadership and that of the other members of the team. Matron smiles during her last community outreach in Ugunja. We at Sagam Community Hospital thank Elizabeth “Matron” Ogada for her hard work and dedication to the Sagam community.